Offers high accuracy with fast response times to quickly capture your measurement and show you trends. Features: Thermocouple Types: K, J, T, E; Dual Inputs; Time Stamp: Relative Time; Splash/Dust Resistant; Dual Display with Backlight; Min/Max.Avg Record; (T1-T2) Readout; Measurement Range: -418 degrees F to 2501 degrees F; Display Resolution: 0.1 degree C/F/K <1000 degree 1 degree C/F/K greater than 1000 degrees. Offer high accuracy with fast response times to quickly capture your measurement and show you trends. Features: Thermocouple Types: K, J, T, E, R, S, N; Single Input; Dual Display with Backlight; Min/Max/Avg Record; Logging up to 500 points; IR Port to download to PC; Measurement Range: -418 degrees F to 2501 degrees F; Display Resolution: 0.1 degrees C/F/K <1000 degrees 1 degrees C/F/K greater than 1000 degrees. 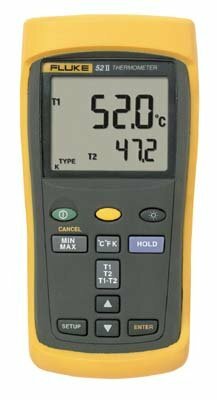 This full function handheld scanning, recording thermometer provides fast response, 0.05 % accuracy and displays temperature in C, F or Kelvin. Dual input type J, K, T, E, R, S, N thermocouples; Data Logging up to 500 points of data with user adjustable recording interval. IR communication port. Real time clock captures the exact time of day when events occur. Recall function allows logged data to be easily reviewed on the meter display. Batteries, plastic storage case or holster, operators guide and user manual. 2-Year conditional warranty. The Fluke 65 Infrared Thermometer provides quick non-contact temperature measurement with 0.1º resolution up to 200º (1º resolution above 200º). Bright laser beam provides easy targeting. The advanced microprocessor allows to save a temperature into memory for later reference. The temperature reading less than 1 second. The Fluke 65 is the ideal tool for measuring surface temperatures of rotating, hard-to-reach, electrically live, or dangerously hot targets. Wide temperature range. + or - 2% Accuracy. degree F/ degree C switchable. Easy to read 1/2" LCD. 3:1 Optics. Surface Mount Technology. 9V Battery powered. Durable Carrying Case. Specifications: Temperature Range - 0 degree to 600 degree F (-18 degree to 315 degree C). Resolution - 1 degree F (1 degree C). Accuracy - + or - 2% of reading, +1 digit; or 3 degree F/2 degree C (whichever is greater). Target Size/Field of View - 3:1. The combination true RMS multimeter and IR thermometer. The temperature range from -4 to 518 F (-20 to 270 C) without contact. Multimeter functions include AC/DC voltage to 600V, AC/DC current to 20A, resistance to 40M, continuity and diode test. Also includes Type K thermometer for contact or air temperature measurements from -4 to 1832 F (-20 to 750 C). Advanced functions include Capacitance, Frequency and Duty Cycle. The megohmmeter test wiring and motor insulation, ground connections and continuity. It also measures voltage and checks connections with its Lo-Ohms functions. 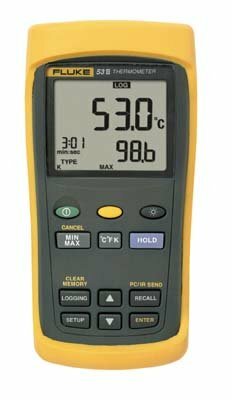 Features: LCD with analog bar graph and digital display; 250V, 500V and 1000V output voltage for insulation resistance testing; insulation testing up to 4000 MOhm; AC/DC measurement up to 600V; auto discharge of capacity voltage charges. 3-year warranty. CE approved. Just the facts: meets IEC 651/ANSI S1.4: TYPE 2; microphone type: 1/2" condenser; range (dB): 30 to 130dB; frequency weighting: A & C; accuracy: +/-1.5dB; resolution: 0.1dB; display type: 3-1/2 digit LCD; analog output: AC & DC; Max hold - Fast/Slow response. Type 2 meter with datalogging memory for 16,000 records, PC interface RS-232 and software. Measuring range from 30 to 130dB. 1.5dB accuracy meets ANSI and IEC 651 Type 2 standards. Max Hold function. Selectable A or C weighting, Fast or Slow response. Large LCD. 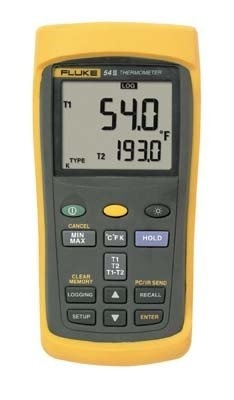 Compact, pocket-sized, 3.5 digit Temperature Meter K Type Thermocouple. 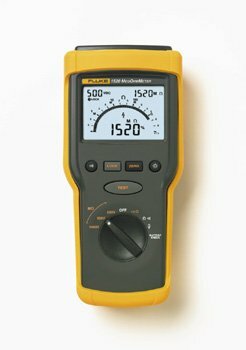 This meter is extremely convenient for the on the go professional or for general lab measurements. Accuracy ± 0.75% for -58°F-752°F (-50°C - 400°C) range and ± 0.1% for 753°F-1382°F (401°C - 750°C) range. Range -4 degree to 1022 degree F or -20 degree to 550 degree C. Accuracy: +/-2 percent Reading or +/-6 degree F/3 degree C >/- 212 degree F(100 degree C). Response time: 1 second. Emissivity: Adjustable 0.10 to 1.00. Sensor: Thermopile. K thermocouple. Accuracy: -40 degree to 2000 degree F: +/-0.1 %.